Finish Rating — See Items 2, 2A, 2b or 2C. 1. Wood Studs — Nom 2 by 4 in., spaced 12, 16 or 24 in. OC as shown in Configurations A, B or C, effectively firestopped. 2. Gypsum Board* — Nominal 5/8 in. thick, 4 ft wide panels, applied vertically to studs and bearing plates with 1-5/8 in. long Type S screws spaced 12 in. OC at perimeter of panels and 8 in. OC in the field. Vertical joints need not be staggered on opposite sides of wall. Horizontal joints of vertically applied panels need not be backed by studs. 2B. Wall and Partition Facings and Accessories* — (As an alternate to Items 2 and 2A) — Nominal 5/8 in. thick, 4 ft wide panels, applied vertically. Panels nailed 7 in. OC with 6d cement coated nails 1-7/8 in. long, 0.0915 in. shank diam and 15/64 in. diam heads. Horizontal joints of vertically applied panels to be backed by studs. 2C. Gypsum Board* — (As an alternate to Items 2 through and 2B; acceptable for use with Configuration A when the studs are spaced 16 in. or 24 in. OC) — 5/8 in. thick, 4 ft wide, applied either horizontally or vertically to one side of the assembly, nailed to studs and bearing plates with 6d cement coated nails 1-7/8 in. long, 0.0915 in. shank diam and 1/4 in. diam heads spaced 7 in. OC. Finish rating 27 min. 2D. Gypsum Board* — (As an alternate to Items 2 through 2C; acceptable for use with Configuration A only when the studs are spaced 16 in. OC only) — 5/8 in. thick, 4 ft wide, applied either horizontally or vertically to one side of the assembly, nailed to studs and bearing plates with 6d cement coated nails 1-7/8 in. long, 0.0915 in. shank diam and 15/64 in. diam heads spaced 7 in. OC. 2E. 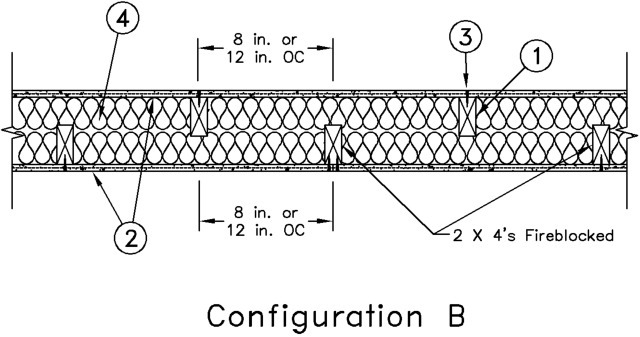 Gypsum Board* — (As an alternate to Items 2 through 2D; acceptable for use with Configuration B) — 5/8 in. thick, 4 ft wide, applied either horizontally or vertically to one side of the assembly, nailed to studs and bearing plates with 6d cement coated nails 1-7/8 in. long, 0.0915 in. shank diam and 1/4 in. diam heads spaced 7 in. OC. 2F. Gypsum Board* — (As an alternate to Items 2 through 2E; acceptable for use with Configuration C) — Nom 5/8 in. thick, 4 ft wide, applied either horizontally or vertically to one side of the assembly, nailed to studs and bearing plates with 6d cement coated nails 1-7/8 in. long, 0.0915 in. shank diam and 1/4 in. diam heads spaced 7 in. OC. Any UL Classified Gypsum Board that is eligible for use in Design Nos. L501, G512 or U305. See Gypsum Board* (CKNX) category for names of Classified companies. 2G. Gypsum Board* — (As an alternate to Items 2 through and 2F; acceptable for use with Configuration A and C when the studs are spaced 16 in. or 24 in. OC) — 5/8 in. thick gypsum panels, with beveled, square, or tapered edges, applied either horizontally or vertically. Gypsum panels fastened to framing with 1-1/4 in. long Type W coarse thread gypsum panel steel screws spaced a max 8 in. OC, with last screw 1 in. from edge of board. When used in widths of other than 48 in., gypsum boards are to be installed horizontally. 2H. Gypsum Board* — (As an alternate to Items 2 through and 2G; acceptable for use with Configuration A when the studs are spaced 16 in. OC) — 5/8 in. thick gypsum panels, with beveled, square, or tapered edges, applied either horizontally or vertically. Gypsum panels fastened to framing with 1-1/4 in. long Type W coarse thread gypsum panel steel screws spaced a max 8 in. OC, with last screw 1 in. from edge of board. When used in widths of other than 48 in., gypsum boards are to be installed horizontally. AMERICAN GYPSUM CO — Type AGX-11. 2I. 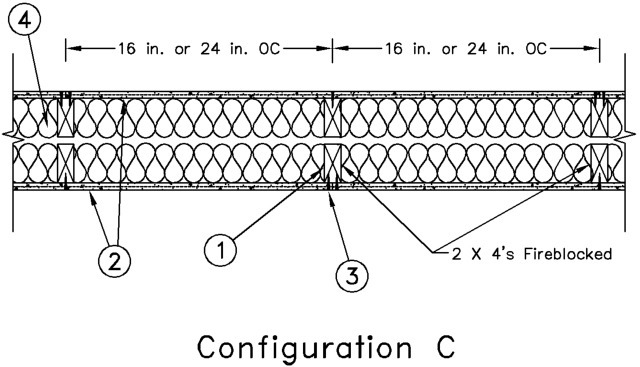 Gypsum Board* — (As an alternate to Items 2 through and 2H; acceptable for use with Configuration B) — 5/8 in. thick gypsum panels, with beveled, square, or tapered edges, applied either horizontally or vertically. Gypsum panels fastened to framing with 1-1/4 in. long Type W coarse thread gypsum panel steel screws spaced a max 8 in. OC, with last screw 1 in. from edge of board. When used in widths of other than 48 in., gypsum boards are to be installed horizontally. 2J. Gypsum Board* — (As an alternate to Items 2 through and 2I; acceptable for use with Configuration C) — 5/8 in. thick gypsum panels, with beveled, square, or tapered edges, applied either horizontally or vertically. Gypsum panels fastened to framing with 1-1/4 in. long Type W coarse thread gypsum panel steel screws spaced a max 8 in. OC, with last screw 1 in. from edge of board. When used in widths of other than 48 in., gypsum boards are to be installed horizontally. AMERICAN GYPSUM CO — Types AGX-1, AGX-11, M-Glass, AG-C, LightRoc. 2K. Gypsum Board* — (As an alternate to Items 2 through and 2J) — 5/8 in. thick gypsum panels, with beveled, square, or tapered edges, applied either horizontally or vertically. Gypsum panels fastened to framing with 1-1/4 in. long Type W coarse thread gypsum panel steel screws spaced a max 8 in. OC, with last screw 1 in. from edge of board. When used in widths of other than 48 in., gypsum boards are to be installed horizontally. 3. Joints and Screwheads — Panel joints covered with paper tape and two layers of joint compound. Screwheads covered with two layers of joint compound. 4. Batts and Blankets* — Glass fiber insulation, nom 3-1/2 in. thick, min. density of 0.80 pcf, with a flame spread of 25 or less and a smoke developed of 50 or less, friction-fitted to completely fill the stud cavities. See Batts and Blankets Category (BKNV) for names of manufacturers.